​Earmuffs are very affordable hearing protection that you can get. It’s also one of the most efficient to use because all you have to do is wear it on your head and your ears are secured from noise, no complicated assembly and mind-boggling operation needed. ​What are the important aspects of the Caldwell E-Max Low Profile Electronic Muffs? ​What other things should you know about the Caldwell E-Max Low Profile Electronic Muffs? These devices are important especially if you like going to a lot of sporting activities like shooting and hunting, or you work in an environment where loud machineries are running non-stop, or you like doing a lot of DIY around the house and finishing mowing chores, etc. A device that you can rely on to help you go through this chores is the Caldwell E-Max Low Profile Electronic Muffs. It protects your hearing with its top-notch quality without putting a dent onto your wallet. These muffs are electronic ones that are able to cancel out noise above the acceptable hearing threshold of 85 decibels. Beyond that, the muffs will automatically block the sound so all you’ll hear is the muffle of the gunshot, keeping your hearing protected. This is ideal for those who are frequents of shooting ranges or hunting events. At the same time, electronic muffs come equipped with two built-in microphones usually on each side that capture soft sounds such as voices, footsteps, movement, and all general sounds that are below 85 decibels. Electronic muffs enable the wearer to hear all these sounds despite the high level of protection through the use of built-in speakers that amplify the sound so you can better hear it. It comes with volume control that captures environmental sounds from 0 to 20 decibels. The headbands are fully padded with thick cushion lined with smooth and soft leatherette so less to no pressure will be put on the top of your head. The headband is supported by metal, which is easily adjustable to your preferred height so it can easily fit heads of all sizes. The ear cups are cushioned and lined with smooth leatherette to avoid irritation of the ears after wearing for prolonged hours. These muffs come with a noise reduction rating of 23 decibels. These NRR is enough for extended hours of hunting or shooting, as it is capable of blocking noise over the acceptable range. Some people don’t find the NRR enough because most noise in a shooting range go way past 160 decibels, depending on the size of the gun. Adding in consideration the frequency of shots in a range, some might need more protection than this NRR. But this really isn’t the case for electric muffs because it is capable of really shutting down at the time of the fire, blocking away the noise completely. Users said that all they head was a muffle of the shots, which is very important especially if the shots are simultaneous and ongoing. If the NRR is not enough, you can opt to add more protection such as donning on earplugs. The Caldwell E Max Electronic Muffs is made of high quality materials beginning from the ear cups made of sturdy and durable plastic. Each cups houses thickly padded ear protection made from high quality cushion covered in smooth leatherette. These cushions may be filled with gel or liquid so your ears will be surrounded by its cooling mechanisms, enabling you to wear it for more hours. These muffs are also foldable so you can easily stow it away inside your bag. The construction quality of these muffs matches the entry-level price, which is very sufficient for most activities requiring hearing protection. Most users don’t run into problems although some experience some difficulties here and there such as when they sweat too much. The sweat condenses on the circuit boards in the muffs, which forms an annoying static noise. Once they dry, they function well again. You may want to consider drying your sweat before it goes into the mechanisms of your electronic muffs, as you don’t want it interfering from blocking the noise. Some users recommend having extra protection, such as wearing earplugs with it when using it in the range. Some large caliber rounds like 30-30 still penetrate the earmuffs that can cause stinging in the ears if heard simultaneously. Lastly, these muffs have a tendency to have audible background hiss. Some reviewers say that this is due to radio signals interfering. 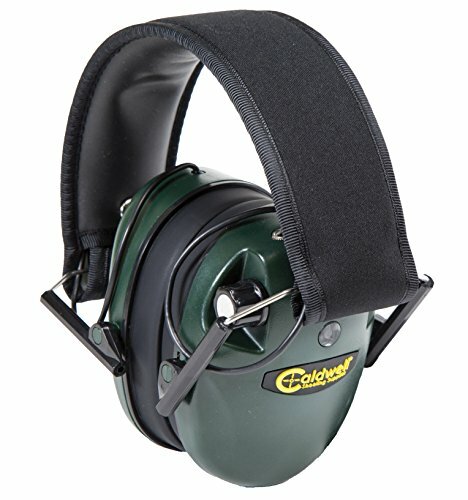 Overall, the Caldwell E-Max Low Profile Electronic Muffs is a pretty good and affordable earmuffs priced only a little bit over 20 bucks. It functions well as an electronic earmuff, effectively shunning noise over the acceptable hearing threshold while enabling the wearer to join in conversations and hear almost inaudible movements and other environment sounds. It is also made of fairly sturdy materials that will last you a lot of uses. For the price, this is really a good investment especially if you’re just starting out in shooting or if you want something that will protect your ears when doing noise-inducing chores and other activities. 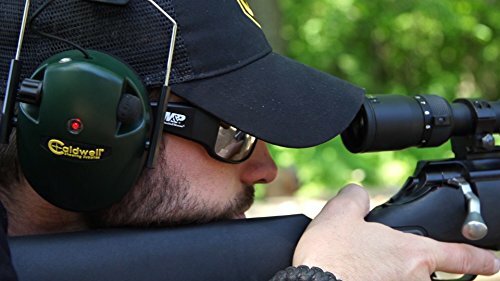 You may check out this related article,"​​What are the best Shooting Ear Protections?" for more ​shooting ear protection choices.